Sidney Nolan is Australia's most internationally celebrated painter and the recipient of many important art prizes and honorary doctorates. Now well into his seventies, he continues to lead an active artistic life and to explore new themes as well as reworking earlier images with the hindsight of old age. He also travels extensively throughout the world. His first trip to China took place in 1965 and he has since made several return visits, drawing upon these experiences to produce such series as 'The Silk Road' of which 'The journey' forms a part. The Art Gallery of New South Wales also holds another five works from this series. Technically, they differ from the earlier oil, acrylic and enamel works for which Nolan is best know, being both spray-painted on canvas and intensely lyrical. 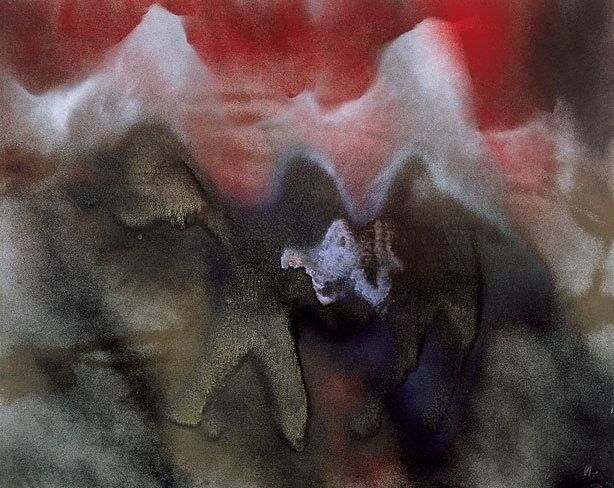 'Nolan has experienced China', wrote an English critic when the latter were first exhibited, 'but he continued his journey he has painted for us [to] an elsewhere never seen before'. Signed l.r. corner, pink acrylic paint, "N [in reverse]". Not dated. Signed top c. verso on stretcher, black charcoal, ".../ Nolan". Ann Proudfoot, An expanded view: the Mary Turner Collection at Orange Regional Gallery , 'An expanded view', pg. 5-23, Orange, 2011, 19, 121.